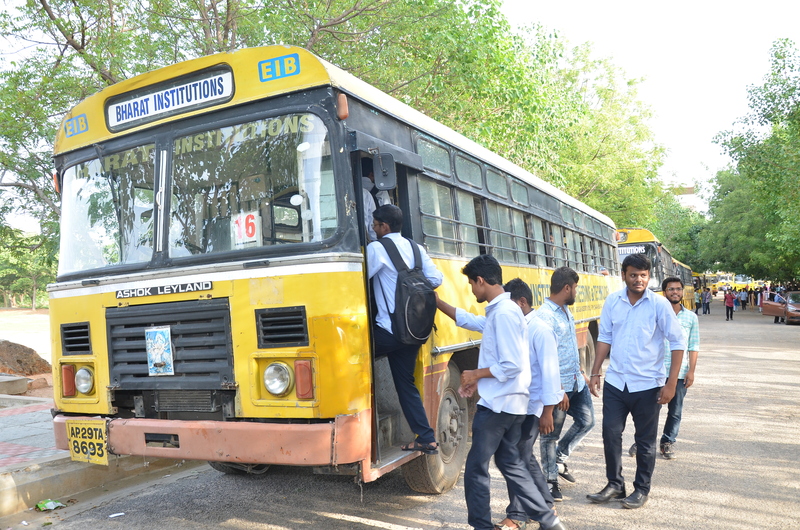 A full fledged Transport department functions in the college with buses to provide transport facility to students and staff from various places at competitive rates. This service is offered ensuring a hassle-free and safe transportation. There are 35 college buses help the students & staff to commute to the college from various places especially all remote areas. The number of buses will be increased corresponding to the increase in the intake of students. 8 INDIRA PARK Indira park, Domalguda, Liberty, Himayatnagar, Barkat pura fly over, Fever hosp, Tilaknagar bus stop, Street no. 6 Street no. 8 habsiguda, Moosarambag more mkt, Moosarambag x road, Tv tower moosarambagh. 13 MOULA ALI Moulali, Hb colony, moulali, Nfc-14, Noma function hall, Mallapur bus stop, Nacharam x road, Vyjayanthi theater, nacharam, Nacharam ps, Hmt nagar, Kamineni hosp, Lb nagar, Omkar nagar, Hastinapuram. 19 MALAKPET Malakpet/ yashoda, Old malakpet, Moosarambag/tv tower, Gaddi annaram, Shivaganaga theatre, Saroor nagar, Sharada talkies, Karmanghat x road, Tapovan colony, Byramalguda, hero honda.